InterPlanetery Broadcast Coin (IPBC) is a new project for sharing digital content online with with an integrated cryptocurrency ecosystem. Think along the lines of YouTube, but without any advertisements, instead users uploading videos on the platform get compensated by the people watching them. IPBC comes with a web media miner that essentially uses some of your computer’s resources to mine while you watch the video and all the used hashpower gets credited to the person that has uploaded the video. There is no need for visitors to download and use a dedicated miner, everything happens directly inside the browser and the mining does not interfere with the video watching. The best thing is that even though IPBC is still a new project the video platform with mining integration is already available, so it is not just something promised to come out after months as it is already out there. You can of course also mine IPBC coins the traditional way, the project uses Cryptonote/Cryptonight (just like Monero) and there are already quite a few pools out there (aside from the official ones) that offer you to mine it. 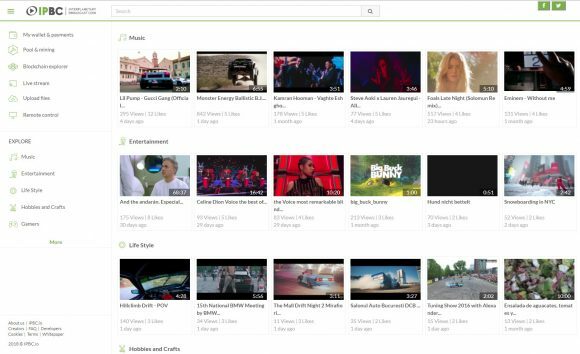 Of course if you are a video content producer you might want to also try the IPBC platform and upload some videos and try that as well. There is also a web-based miner available for users built inside the platform, though you probably would want to stick to GPU mining with dedicated mining rigs than to use the web-based CPU miner yourself. The project looks promising and is already doing quite well even though it is just a few days since the official announcement, the team has already announced their plans to have the coin listed on an exchange (listing on Livecoin has been announced for February 21st) as well as other interesting plans for improvements and new features… remember that it has just launched and the IPBC platform is still in beta.